The CONDOR a350 Motorcycle Manual PDF is above the page. In 1893, in the small Swiss town of Courfevre, French immigrants Eduard and Jules Scheffer founded their own bicycle manufacturing plant. Approaching the matter thoroughly, they organized on-site a full cycle of production of components for their products. At the beginning of the 20th century, the factory acquired the name and emblem - the wings of a Peruvian condor. The engineer Otto Fricker, who came to the company in 1898, began work on his own internal combustion engine. In 1901, the first "Condor" motorcycle left the factory gate. In fact, it was a bicycle with a 1.5-strong engine mounted in the frame and a direct belt drive for the rear wheel. The ignition system was a rechargeable battery and a high-voltage coil. The only shoe brake acted on the belt rim of the rear wheel. In 1904, Otto Fricker became the director of the company. Thanks to his initiative, the production of military bicycles began in 1905. After recommending itself as the manufacturer of reliable products, the company "Condor" subsequently became one of the suppliers of motorcycles for the Swiss army. After the war, the firm "Condor" brought to market several new motorcycles with MAG motors, equipped with a gas distribution mechanism "valve over the valve." The single-cylinder engine with a working volume of 250 cm3 was combined with a three-speed gearbox of the conventional type, with the transmission being chain-driven, and the rear-wheel drive being carried out by a belt. The heavier models with similar V-shaped two-cylinder engines with a working volume of 500, 750 and 1000 cm3 had a chain drive of the rear wheel, and a shoe brake acted on the surviving belt rim. 30-ies brought the expansion of the two-stroke family: in addition to the model "Condorett" appeared 98-cub. Motorbike and 196-cc light motorcycle, also equipped with power units of the company "Villers" (Manuals PDF page). Cubature 250 cm3 disappeared altogether, but in other classes there were new items. After the end of the Second World War under the brand "Condor" for a while, pre-war models were produced. Then there was an absolutely new army model "A 580" with a two-cylinder opposed lower-valve engine with a working volume of 577 cm3. 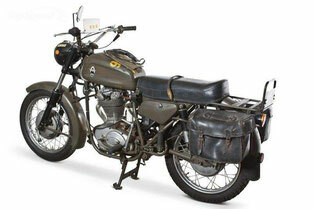 The motorcycle was created "on motives" of similar models of German companies BMW and "Zundapp" (PDF Manuals pages). The first versions were equipped with a parallelogram front fork with feathers from heavy stamped parts. The civil car with the index "EU 580" received a telescopic front fork and a candlestick suspension of the rear wheel. Since 1950, the series went to an improved version of the "A 750" with an engine increased to 750 cm3 of working volume. Then, in 1950, appeared a civil motorcycle model Racer with a two-stroke two-cylinder 350-cc engine. A few years later, under the brand "Condor" debuted model Grand Sport with a top-hat 250-cc engine "Maserati". It was built before 1961, becoming the last "Condor" for civilians. Single-cylinder 250-cc top-valve army motorcycle "A 250" began to be supplied to the Swiss army in 1961, and in the early 70s it was replaced by a motorcycle equipped with a 350-cc Ducati (Service Manuals page) engine with desmodromic valve drive. It became the last history of the firm "Condor", which ended in 1978. Since that moment, the company has been exporting Italian motorcycles to Switzerland, but it does not produce moto.